Flip X coins; an opponent calls heads or tails. 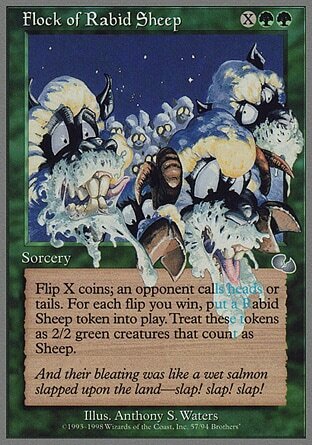 For each flip you win, put a Rabid Sheep token into play. Treat these tokens as 2/2 green creatures that count as Sheep. Mouton Enragé. Considérez ce jeton comme une créature verte 2/2 Mouton.